A True Desi Recipe that will leave your palate wanting for more..........!!!!!!!! 1) Take a 1.5 - 2 kg country chicken bird (desi), cut off it's head and remove feathers . 2) Roast it evenly for 15-20 mins on charcoal till the skin turns to dark brown . 4) Now cut all the bird into required size pieces . 2) Now add coconut powder and poppy seeds then roast these till the color changes. 3) Put all these spices in blender(grinder) make coarse paste by adding little water. 4) Take one onion and make its paste in blender and mix it with ginger garlic paste. 1) Take a dish add oil and chopped onion, sprinkle little salt & fry till it is 70% cooked. 2) Now add onion and ginger garlic paste and fry it till raw flavour goes away. 3) Add chicken, red chilli powder, coriander powder, turmeric and salt . 4) Fry chicken for 10 - 15 mins on medium flame, don't allow blackening of any part. 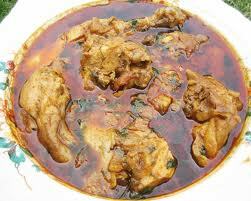 5) Now add water(till whole chicken is immersed and then add one extra glass) and prepared masala.Cook finely. 6) Finally add coriander leaves and mint leaves and switch off stove. Caution: Please adjust spices according to your taste. Enjoy this delicious dish with naans, roti, rice ....!!!! !